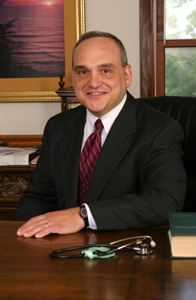 Dr. Michael Michelotti is an experienced and respected surgeon. He has practiced in the area since 1987. Dr. Michelotti was an attending surgeon at Sherman Hospital in Elgin and Provena St. Joseph Hospital in Elgin. Dr. Michelotti is a graduate of the Honors Program in Medical Education at Northwestern University Medical School in Chicago and completed his General Surgery Residency at the McGaw Medical Center of Northwestern University (Northwestern Memorial Hospital). Dr. Michelotti is certified by the American Board of Surgery and a Fellow of the American College of Surgeons. Dr. Michelotti has served as chairman of the Department of Surgery, Chairman of the Credentials Committee, President of the Medical Staff, and Foundation Member at Provena St. Joseph Hospital. Dr. Michelotti is interested in the broad scope of General Surgery. He has special interests in minimally invasive laparoscopic surgical techniques, breast surgery, bariatric surgery, and hyperbaric oxygen therapy for chronic wound healing. Dr. Michelotti is currently practicing in the Rockford area and accepting referrals. Contact information is available through our office.